8apps is a social network for productive people. The name itself tells you that it is a combination of 8 applications to increase your productivity. Currently only 4 apps have been implemented, Handshake (social network), Orchestrate (task management), Blueprint (brainstorming) and Pinpoint (meetings). Hand Shake: Handshake is a social network application of 8apps. 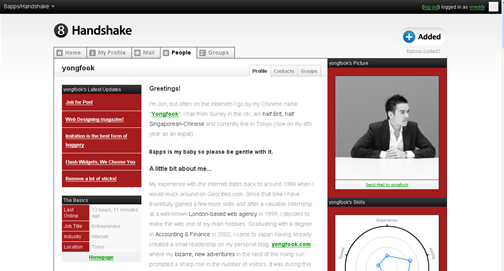 You can create a profile, browse other user profiles and contact other people. Orchestrate: Orchestrate is a task management application where you can create to do lists and share with your contacts to better organize. Blueprint: Blueprint is brainstorming application where you can discuss about possible projects with your contacts. Pinpoint: Pinpoint is the social meeting application, you can arrange a meeting time with your contatcs. 8apps is a nice tool for collaborative working and to meet interesting people based on similar interests. I have 50 Invites left, drop a comment if you want one. oh my god! another social network…!! But atleast they’ve got something unique and not like all those social networks cropping up every now and then! Looks good! Can you me an invite please? Thanks! Looks interesting. I am enough of a time-management-networking nurd to ask –can I have one? I’m very impressed, just the thing I need for our EV project. Will someone please send me an invite? This is interesting. May I have an invite. This is perhaps the finest discovery of the week… Really looks cool and useful… Please can I have one invite. Thanx. What a generous person you are. Could I get one? Thanks! Looks cool. May I have an invite please? Hi, 8apps looks really cool. Love the personal productivity focus. Do you have any invites left?